I finally joined the 21st century and got an iPad, and I love it. Know who else loves iPads? Penguins. 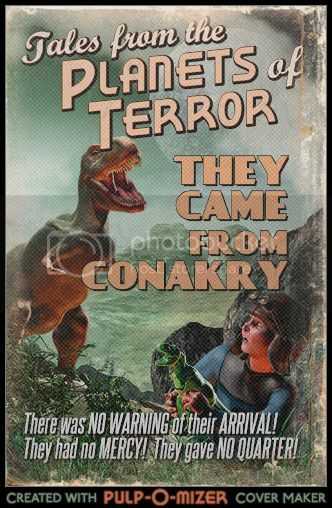 Speaking of past versions of the future, you can make your own pulp sci-fi covers with the Pulp-O-Mizer. Here's mine. Need a new book but don't know which one? Try What Should I Read Next? If you like that, you'll want to meet Cory Calhoun, master anagrammist. Alaskan brewery makes beer with power from beer. Jabberwocky sez: quit wasting time reading this article about why cats like to be petted and just get on with it already. The anagrams link reminds me of the Simpsons episode where Lisa is supposed to find an anagram for Jeremy Irons' name. I think the best she comes up with is 'Jeremy irons'. Lol. About as good as I would do. I've always been hopeless at that kind of word gaming - I'm terrible at Scrabble - and so impressed by people who are good at it!